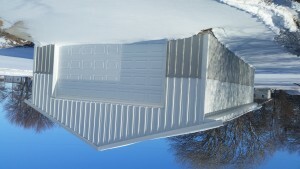 This new building sitting south west of the fire department is a newly built garage funded by the fire department. Its purpose is to house a few items that do not fit in the existing building. The first item is a portable light trailer that was donated from the state of South Dakota and built by inmates. It is a handy and useful piece of equipment that is just plain in the way. The next item never did fit into the hall. It is an antique fire fighting apparatus. This item has been sitting in one of Benton Visser’s barns for many years. Many people volunteered their time and efforts to help Benton and Aaron Visser to build this garage. Troy Melloon and Kurt Weins poured the concrete slab; also had Chad (don’t know his last name but he is currently renting Tim Gamber’s house on Maple street) help on the day of the pour. James Antinucci and Cathy Beil framed the walls up. Then James had Chad Mosley’s help to set the rafters. Then James and Cathy sheeted the walls and roof. I helped Benton and Aaron install the steel. And Mike Feste will be doing the electrical wiring.